According to some health-related sites, 40% of women experience some hair loss during menopause. I'd estimate double that percentage will notice loss in the decades that follow. If you've maintained thick, healthy hair into your 50s or beyond, are you lucky! But if you always had fine hair and are now losing some, your heart sinks when you look at your brush. Fighting the myriad signs of aging isn't the best use of time, but we all want to look good, and hair is a very deep subject for women. Since my initial post, I've observed hordes of women getting extensions at my new salon. My stylist says about half are mature women; the other half are 20-and-30s who want their luxuriant manes bumped up to unnaturally lush levels. I've seen so many applied that I no longer think "great hair"; I think, "$1,500 in extensions". The problem is that extensions add volume only from mid-crown to mid-head, so if you're thinning on top or at the temples, they won't cover that. I don't have extensions, but if you do, please tell us how you like them. I watched a soignée woman in a posh department store ladies' room casually take out a small compact that I thought was eye shadow and daub it at her hairline, near the part. She saw me staring (well, wouldn't you?) and showed me her DermMatch. Her bob looked just fine, but she had an area at her temple where her part revealed a receding patch, about the size of a quarter. DermaMatch is scalp makeup, designed to 'paint in' the bare scalp so it blends with the hair. She pulled back her bangs to show me the opposite, untouched temple hidden by her bangs– a dramatic difference. She said there was a little rub-off on her pillow but she'd changed to dark cases. Caveat: The product would not look realistic on large areas like a full part or thin crown. She said if the bare spots grow, she will have a transplant, and is unwilling to take drugs like Propecia. She has localized hair loss; there are other approaches for overall loss of fullness. Volumizing shampoos and conditioners are multiplying as cosmetic companies respond to boomers' dismay over hair you can see through. You can drop double digits on fancy salon stuff, but Good Housekeeping gives top marks to two Pantene products, Pantene Pro-V Full & Thick Shampoo and Conditioner, each under $6 at most drugstores. These expanded strand diameter up to 9% and got top marks from consumers for making hair look thicker. Dry shampoo applied at the roots to add lift from the scalp is another stylist's weapon. I like Klorane Gentle Dry Shampoo, also great for travel. Another strategy is an optical trick: place some highlights or lowlights near the face to provide contrast, which reads like thickness. But, stylists counsel, don't carry those lights throughout the head, because if they dry out the strands, you can get breakage of that now-finer hair. M., a pretty, 60ish woman in the beauty industry, told me that she teases to add volume. She lightly back-combs the under section only, beginning at around ear level (where one would normally add extensions) so the top layer of hair falls naturally over the teased underlayer. On the weekends, she gives it a rest by brushing it back, held by a scarf or barette. She invited me to touch her hair; there was about half as much there as I would have guessed. M. had lightened her colour to several shades of pale blonde, because a high contrast (dark hair, white scalp in her case) makes hair look much thinner. 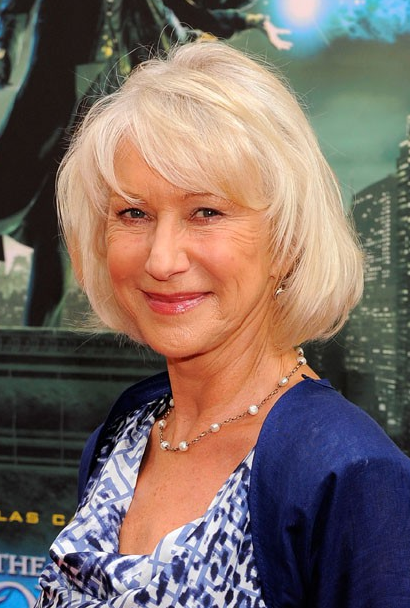 Helen Mirren has fine blonde hair like M.'s, and appears to have volume added either by restrained back-combing or a roller set, then relaxed by a blow-out. She could also use extensions; many actresses do. And I hope you noticed Dame Helen's pearls. I am one of those dealing with thinning hair. The dry shampoo works really well for me so I use it regularly. I've also found, after some reading, that vitamins high in zinc help lessen hair loss. This surprisingly works! My hair has always been thin, and I anticipate it will only get thinner. I've been keeping it a medium brown because I like the contrast, but imagine at some point I'll either let it go gray (according to my colorist, I'm 70% grey now in front, much less in back) or go for a lighter ash brown or even dark blonde. Keeping it short seems to help too, less weight to emphasize a part, and easy to fluff up a bit with my fingers. My hair got thicker for a while, as the hairs seemed to get coarser. But thinning has begun. Boo. And the dreaded pink scalp has made somewhat of an appearance. I use a voluminizer on the roots. And stay in denial:). At 42 I've been dealing with thin, fine hair for years unfortunately. I use Rogaine 5% mousse/foam and a dry colored shampoo too. These make the problem tolerable. My favorite dry shampoo is Batiste. I like the light, non-sticky quality. I've tried Bumble and Bumble, T3 Orlando Pita, Oscar Blandi--Batiste is my favorite. I'll try the one you suggested, Duchesse, because I'm always looking for the Holy Grail. :-) This problem has plagued me, but there are far worse things, I've decided. Trying to figure out what to accept as I age and what to battle, I have drawn some firm lines in the sand. I refuse to have pumped up lips or cat eyes. However, my hair is getting thinner along the part-line. It was always thin and fine, but now it is becoming too apparent for my comfort level. I started using Rogaine along the part line. They say it takes a while for it to work and to give it 4 months. It is easier than I thought and does not leave a greasy residue. I just blow dry with a round brush when I am done. So, I will know around September 25th if this works. I hadn't considered using anything...good to know there are products on the market if things get really patchy. I did notice Helen's pearls! My whole family has thin hair - and I've noticed mine thinning out as I get older. Recently I added (a lot of) highlights and cut my longer hair into a bob. The combination has done wonders for the overall appearance of a healthy head of hair. I have been trying some different volumizing shampoos but none has really come to the fore as a great choice. One care tip that seems to really help the drying/fragile ends: a weak vinegar rinse in the shower about once a week. My hair is noticeably shinier and softer when I do this - and not weighted down like it can be. Once my grey mellows into a color instead of dramatic streaks I will back off the coloring, as I do notice the effect on the "bounce." Thanks for the names of the products. I find that one of the first things I look at in women my age is hair. Some southern women still have thick, opulent hair but when you have fair locks, they thin out earlier. I feel very self-conscious about that ! Laura: Thanks, I had not heard about the effect of zinc. pseu: Colour adds volume to my hair, too. it looks its thickest just after a visit. LPC: Denial is fine, otherwise just too much to fret over. Many women wear their long hair up as a solution. Anonymous @ 10:51: Spacegeek likes Rogaine and I hope it works for you. I don't do injections; my vanity work is tooth-bleaching occasionally due to a love of coffee and red wine. hostess: That front part is similar to male pattern baldness but so different for women. Silver Bunny: Do they have the same fondness for extensions? Here, I see some incredible manes but much of it is done with someone else's hair applied into those little doll strands. Extensions seem like such torture I can't imagine submitting to them. But then, my hair has always been so thick and heavy that any thinning has been more help than harm. For those looking for more fullness, I will pass on this tip a hairdresser gave my friend: Reverse your part every couple of months; combing your hair against the direction it's been growing in will give a bit of temporary oomph. For a while, I was using a clip to hold my hair at the crown. I noticed my hair was thinning on top and decided to do away with the clip except occasionally. So now, nothing that puts tension on the hair for me. I've gotten some new hair growth on top as a result. MIght help someone else. pinkazelea: Any kind of tension on hair will ultimately cause breakage, and as hair naturally thins as we mature, that is ever more noticeable. Jill Ann: My stylist told me I could not get extensions even if I wanted them b/c they are not available for curly hair (except those novelty synthetic ones.) Since my aunt and mother's hair thinned, and I have the same, I expect mine will, too. Just say no to dyeing and bleaching. The women I see with beautiful thick and shiny hair after 55 are all (going) grey naturally. Not only does dyeing thin it, but your hair comes to resemble cotton candy or worse, a Brillo pad. Danielle: I see plenty of thin, lank grey hair, as well as thick. I've dyed my hair (professionally) for maybe 22 years, and it is in extremely good condition. Over-processing is hard on hair, so it depends on what one is doing. I'm with you, Duchesse. Shiny silver manes can be gorgeous, but there's something very sad about lank grey hair. My hairstylist (who never pushes color) says that most grey hair benefits from coloring as much for the added texture as for the color change. As you say, it's how well it's done (and how it suits your complexion and personality) that matters. I've found my hair has gotten thicker by replacing dyeing with henna (it moisturizes and coats the hair strand rather than chemically breaking it down), gradually cutting shampooing down to once a week (your scalp adjusts its sebum production to not require such frequent shampooing), and a shorter more layered haircut. I would never consider extensions. I think you are right in that we will be noticing many more women experiencing thinning hair in the coming years. It has a lot to do with hormones and let's face it, our lifestyles are not doing much to help. I've been trying a couple of things and the latest thing I've heard about was emu oil. Too early too say if it works but I came across the article at howtostophairlossforwomen.com. The information came to me from a newsletter I'm signed up to, so let's see! lilly: Henna does not give the colour I want but if it works for you, that is great! Like you I have cut shampoo to 1x/wk, washing other days just with tepid water. Works very well. Anon@ 2:05:' Emu oil! Please let us know how you find it. C. Reversing a part does work for awhile. Anon@ 11:49: I really like how women are claiming their grey as beautiful. (One of my friends says, "It's not grey, it's *silver*.) But grey is not immune to thinning. Duchesse, I'm no sure if you know, but henna can produce auburn and bown shades by mixing it with indigo. I started henna when I had very little white. As the white patches increase, I've found I can keep the same rich shade of auburn-brown by adjusting the indigo content. Luckily I have quite thick hair although not as thick as it was. I find loreal age premium conditioner helps. My 85 next door neighbour here in France gently pulls her silver (thinnish) grey hair back and then adds a matching fake chignon and it looks works well. chicatanyage: I find those hairpieces genius! It is in the back of my mind should I heed it. I also have inherited fine hair which is thinning due to hypothyroidism. I am trying Redken IntraForce. After a month, the main difference has been that my grey streaks are less pronounced - more like the rest of my ash-brown hair. I will preserve in hopes it will help my hair appear thicker. Anon@12:30: Again, thanks for telling us about another resource, hope it is effective for you.